When you need a breakfast to feed a crowd this Sausage Hash Brown Breakfast Casserole just might be your answer! 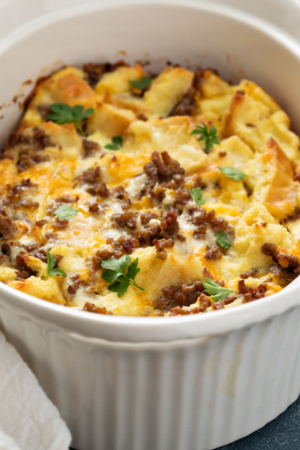 A baked breakfast casserole filled with hash browns, ground sausage and cheese all held together by eggs. A complete breakfast all in one dish! A delicious slice of sausage hash brown breakfast casserole. I first started to make this sausage hash brown breakfast casserole when the kids were little. It was around the holidays and we had family coming over to celebrate. Because they were coming over early I wanted to make everyone breakfast. However, I didn’t want to spend the time cooking 4 different things in 4 different pans. Not only would it mean that I spent most of my morning in the kitchen preparing breakfast, but also afterwards cleaning up all of the dishes. I wanted to be able to spend time with the family visiting, not working. Egg is the binding ingredient that holds the sausage and hash browns together. So instead, I decided to make this sausage hash brown breakfast casserole. It is a full breakfast that is prepared and then baked in one pan. Even the pickiest eaters love it! The best part about this classic dish is that it can be customized to each individual’s taste. For instance, my husband tops his with diced jalapeno and Pico de Gallo. The oldest tops his with more cheese and a dollop of sour cream. And the youngest adds hot sauce and fresh ground pepper to his. And let’s not forget the middle child. He loves to put his slice on a bed of fresh spinach and then green and red peppers are added to the top. I make this sausage hash brown breakfast casserole any time that I am going to have a house full of people in the morning. I always make it on Thanksgiving, Christmas and Easter morning. But also when we have a house full of people who have spent the night. It is an easy to make casserole that is serves plenty and requires little preparation and clean up. And that is important on a busy day! To save time in the morning, I brown the sausage the night before. In fact, I will brown the sausage ahead of time so that I don’t have to waste time doing that the morning of the holiday. When I find sausage on sale, I will buy it, brown it, and freeze it for later use. Then all I have to do is pull it out of the freezer and throw it in the casserole. Or, if I didn’t have any frozen, I would brown it the night before. Throw it in refrigerator and add it to the casserole in the morning. This recipe calls for a bag of frozen hash browns. However, if you prefer, you can make your own hash browns from whole Russet potatoes. You can shred your own potatoes if you prefer. 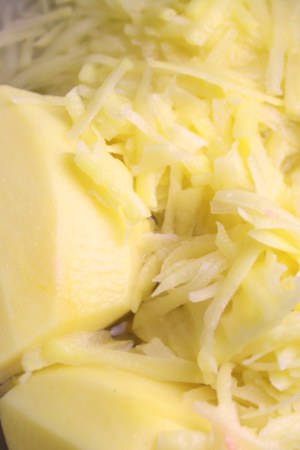 Using a food processor or grate (we prefer our Hamilton Beach Food Processor), shred 3-4 potatoes. Place them in cold water and rinse thoroughly. Bring a large pot of water to a boil. Add the potatoes for 3-4 minutes. Remove, drain and run them under cold water for an additional 2-3 minutes. Be sure to stir the potatoes while the water is running so that the bottom potatoes get under the cold water too. Drain and pat dry before adding them to your casserole. Can Sausage Hash Brown Casserole Be Made The Night Before? You can definitely make this recipe ahead of time and put it in the refrigerator, unbaked. Just be sure to bring the casserole dish to room temperature before baking. However, I prefer to prepare the ingredients the night before and throw everything together the next morning. It comes together so quick and there is no waiting for the dish to come to room temperature before putting it in a hot oven. Baked sausage hash brown breakfast casserole. Brown the sausage and shred the potatoes (if I am not using store-bought frozen hash browns) the night before. I will even take it one step further, and dice and chop up any toppings that I think might be used. 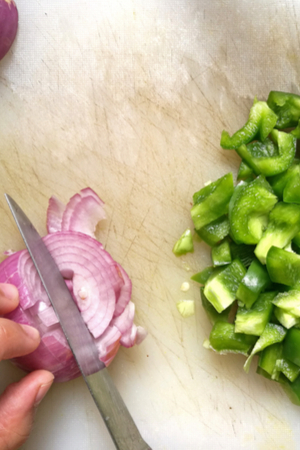 A few green onions, jalapeno, green peppers, red peppers, and whatever else you can think of! So if you are looking for a breakfast to feed a crowd, give this Sausage Hash Brown Casserole a try! 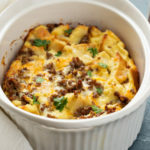 You can also make Instant Pot Breakfast Casserole if you are feeding a smaller crowd. 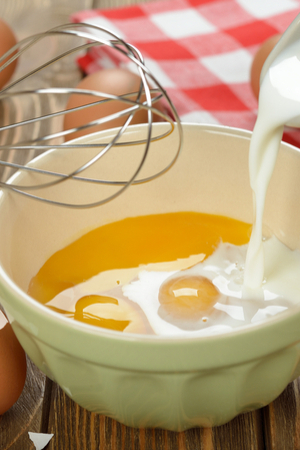 Find some of our other BREAKFAST RECIPES HERE. 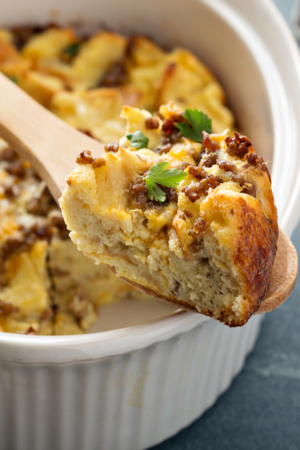 A delicious sausage and hash brown breakfast casserole that is perfect to feed a hungry crowd. 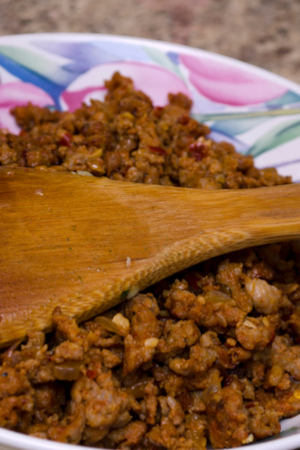 In a large skillet over medium-high heat add ground sausage and cook until no longer pink. Drain well. In a large bowl stir together sausage, hash browns, ½ teaspoon salt, pepper and cheese. Pour into a lightly greased 13- x 9-inch baking dish.